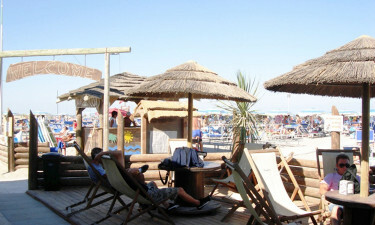 Camping Tahiti is a luxury camping site that is situated on the stunning Adriatic Coast of Italy. 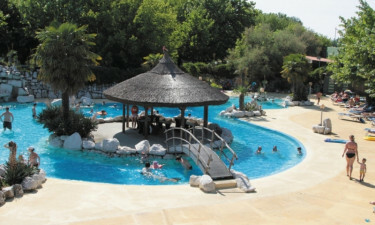 This is the ideal location for sun worshippers who want to spend their time soaking up the sun on the nearby beautiful beaches, while people who enjoy being active while they are away will find a large number of options that will help to make this the luxury camping experience of a lifetime. Why choose a camping holiday at Camping Tahiti? One of the great things about this location is that a pristine sandy beach is just a short stroll away from Camping Tahiti. This long and lovely stretch of sand is just waiting for sun worshippers to spread out and soak up the sun for a few hours. The waters that lap the shore are cool, clear and ideal for swimming, while a large number of other types of aquatic activities such as kayaking and windsurfing can also be enjoyed here, and equipment is available for hire. The little ones are sure to have fun when they take part in the Mini Club, which offers a wide range of different types of activities, such as pottery classes that are supervised by staff members. This gives parents the chance to unwind in style or take part in a whole host of onsite activities, or take off on a cycling or Nordic walking tour of the surrounding area, safe in the knowledge that the little ones will be in good hands. The onsite Thermae Oasis has been designed with luxury and relaxation firmly in mind. 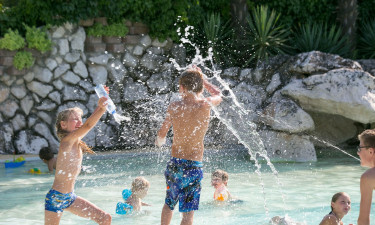 Visitors will be able to enjoy plenty of pampering as they plunge into the waiting waters here, while there is also a wide range of popular spa treatments to choose from, and lush Roman-inspired gardens for visitors to wander through. People who choose to rent a mobile home at Camping Tahiti will find an excellent range of dining options onsite. The enchanting poolside bar and grill offers visitors the chance to enjoy a few light bites while they soak up the sun. Those who are searching for something a little heartier will have the chance to relax for a while in the main restaurant as they sample some of the finest dishes that Italy has to offer. This award-winning campsite is equipped with its own supermarket, where holidaymakers can pick up groceries and toiletries to use during their stay. This is ideal for people who like to prepare their own meals and picnics in their mobile home. Freshly baked bread is also provided each morning, while there is a good selection of shops to be found in the nearby coastal town of Lido delle Nazioni.